Most orders will be received within 3-5 business days by ground. For faster shipping options / costs, please call (410) 256-8388. We ship only to the U.S.A. (50 states). For locations outside of the Continental U.S. (48 states), please call to order and quotes. 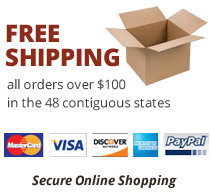 Free shipping on all orders over $100 is limited to the Continental U.S. (48 states). All other locations please call for quotes. 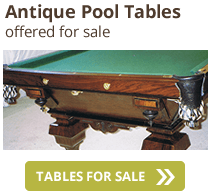 Some large items, including but not limited to tables and reproduction accessories, or any items purchased from Classic Billiards not displayed on this site are ineligible for free shipping. One free box of 12 cubes of Silver Cup chalk (color to match cloth purchased) will be included with all cloth orders when it is shipped. Each piece of cloth is inspected for flaws prior to shipping but we are not responsible for variations in final product. The “UP” side is marked on each piece. Image colors and brightness of fabric on this website will vary by computer. If a cloth is returned in unopened/new condition due to customer ordering wrong size or color, a $15 restocking fee will be charged. 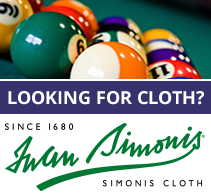 Please see our how-to on measuring your pool table for the proper cloth size. If you order an incorrect size or type and must return an insert or cover, there is a restocking fee of $30 for inserts and $15 for covers. Please call or email if you need assistance ordering the right size or type for your table. 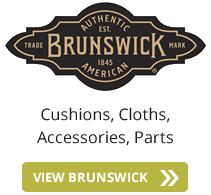 You may place your order online via this website or call (410) 256-8388. For outside of the Continental U.S. (48 states), please call. We accept VISA, MasterCard, Discover, American Express, JCB, Diners Club, and PayPal. All media (downloaded or samples), software, text, images, graphics, user interfaces, music, videos, photographs, trademarks, logos, artwork and other content on this web site (collectively known as "Content"), including but not limited to the design, selection, arrangement, and coordination of such Content on this site, are owned or licensed by or to Classic Billiards / AllPool.net and is protected by copyright, trade dress, and trademark laws, and various other intellectual property rights laws. Copyright is the intangible property right granted by Federal statute for an original work fixed in a tangible form of expression. Copyright provides Classic Billiards / AllPool.net with the following exclusive rights in a work: to reproduce, to prepare derivative works, to distribute by sale or otherwise, to perform publicly, and to display publicly. Federal Law prohibits any unauthorized use of Classic Billiards / AllPool.net copyrights without the prior written consent of Classic Billiards / AllPool.net.